Without mountains there are no valleys. Some valleys in Hawaii are so steep that they only get a few hours of sunlight each day. They were practically impossible to live in. Most valleys are wet and protected, perfect conditions for growing trees like breadfruit or bananas or other valued plants in Hawaiian culture and medicine. Maui's nickname is "The Valley Isle." Kalalau Valley on the island of Kauai. Wikipedia Creative Commons. Photo released into public domain by Gh5046. 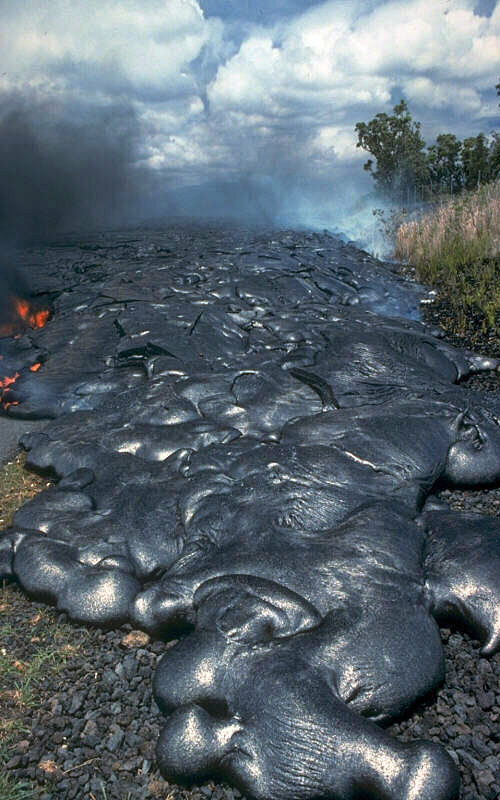 Tourism is considered the lifeblood of Hawaii. 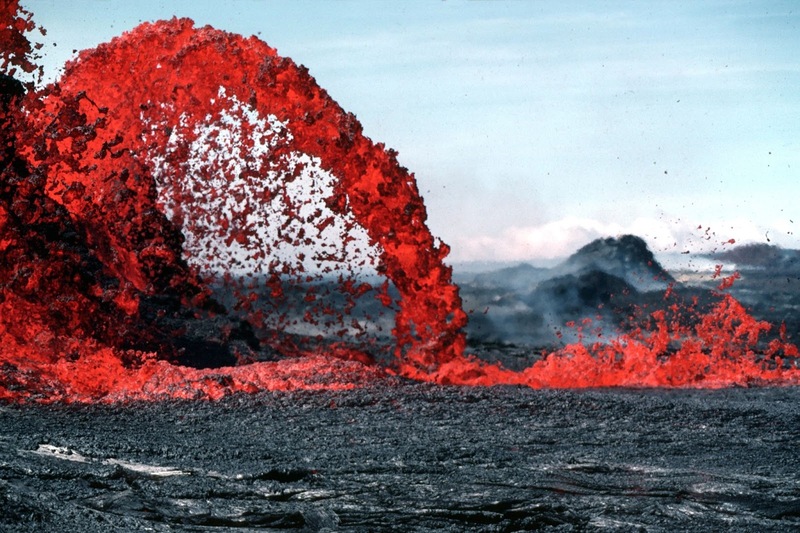 Tourism dollars pour through the coffer of Hawaii. The news constantly reports hotel occupancy rates, dollars spent each night per visitor, or how visitor numbers rose or fell this year from last year. Many jobs are tied to tourism, even though they may not be directly related, like restaurant work, construction, or salon services. Tourists on Maui watching the waves at Ho'okipa Beach Park. The tourism debate has been raging for decades: Is Hawaii too dependent on tourism? Shouldn’t Hawaii try to diversify its economy with agriculture and technology? Do the benefits of tourism outweigh the costs of tourism? Is tourism changing the local way of life? Is tourism promoting the Disneyification of Hawaiian culture? Intense sunset over Kahoolawe Island, viewed from Maui's South Shore. When I read this passage, it really struck a chord. Theroux is like the devil's advocate, talking about the darker side of sunlight. It’s like Dorothy pulling the mask off the Wizard of Oz. "Stranger, be grateful to me for this sunny day" was our attitude toward visitors. The sun had been bestowed on us and we were sharing it with these alien refugees from dark cloudy places... 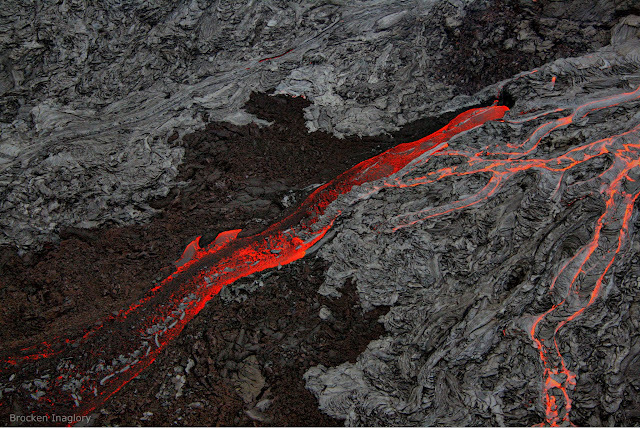 The Hawaiian heresy, which we thought but never said, was "We are good because of the sun. We are better than our visitors. We are sunnier." "This Hawaiian heresy was dangerous, for it made us complacent about the damage we did to these little crumbly islands. We were so smug about our sunshine, we were blind to everything else, as if we had been staring at the sun too long." For me, these passages hit a nerve. Hawaii is blessed to have a lot of sunshine, even if I live on the rainier side of the island. I wouldn’t say that I feel superior to someone visiting Hawaii, but there is definitely a smugness about living in Hawaii, especially when it’s snowing and wintry on the mainland. Or a belief that the way of life here is somehow better, without the focus on work and “getting ahead” and status and “climbing up the ladder.” If there is enough sun, who needs all that? Is material success as important as sunlight? Theroux is also right when he talks about the damage we do these islands. The pace of life may be slower here, but people can still do careless things, from bringing foreign species to Hawaii to overusing or damaging the natural resources. Are we too complacent in Hawaii? Or are we humans too complacent in general, no matter where we live on earth? Is there a dark side to sunshine? Besides being smug and complacent about sunlight on a cultural level, as individuals, it's also very easy to get sunburned or increase one's risk of skin cancer. When there's so much sun, we can get careless and take our bodies for granted, the same way we can take our islands for granted. It's not intentional, but we forget to take care. Intense sunburn. This tourist from Germany was kind enough to let me take his photo for my blog to illustrate the danger of too much sun. Tourists on their first day or two on Maui don't realize how intense the sun is here, closer to the equator. Missionaries and other foreigners brought many things, both good and bad, to Hawaii in the 1800s, including: books, Christianity, tools, opium, their music, the mongoose, diseases, kiawe trees, the alphabet. They also brought quilting. A Hawaiian quilt pillowcase I stitched, bougainvillea pattern. I did break a rule of not following the contour quilting all the way through the center of the quilt. 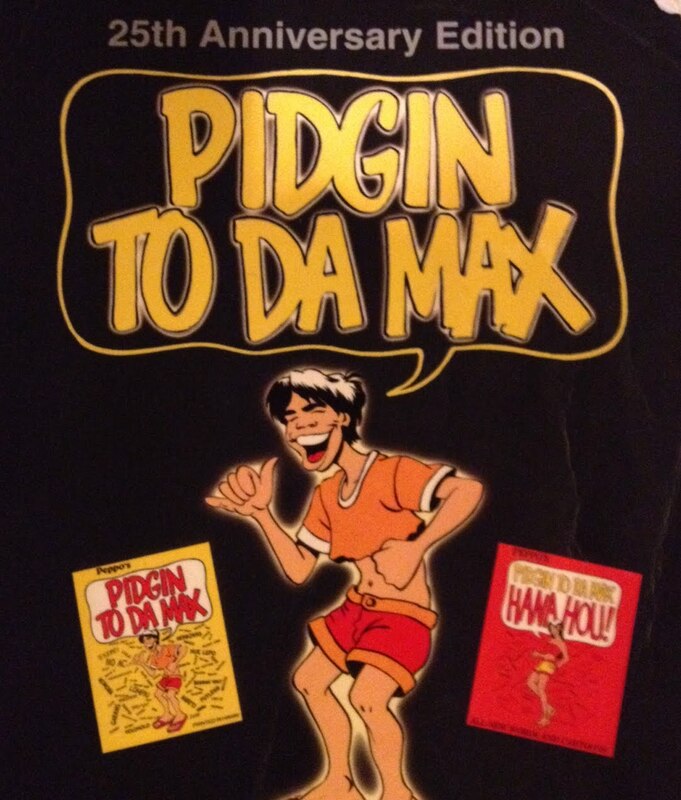 Many people in Hawaii think of pidgin was as a mish mash language, a broken up version of English, complete with bad grammar. It’s a language that developed during the heyday of the plantation era. People from all different countries were brought to Hawaii to work on plantations, and no one could understand each other. So over time, they cobbled together this language that borrows words from Hawaiian, English, Chinese, Korean, Japanese, Portuguese, Samoan, and the languages of the Philippines. 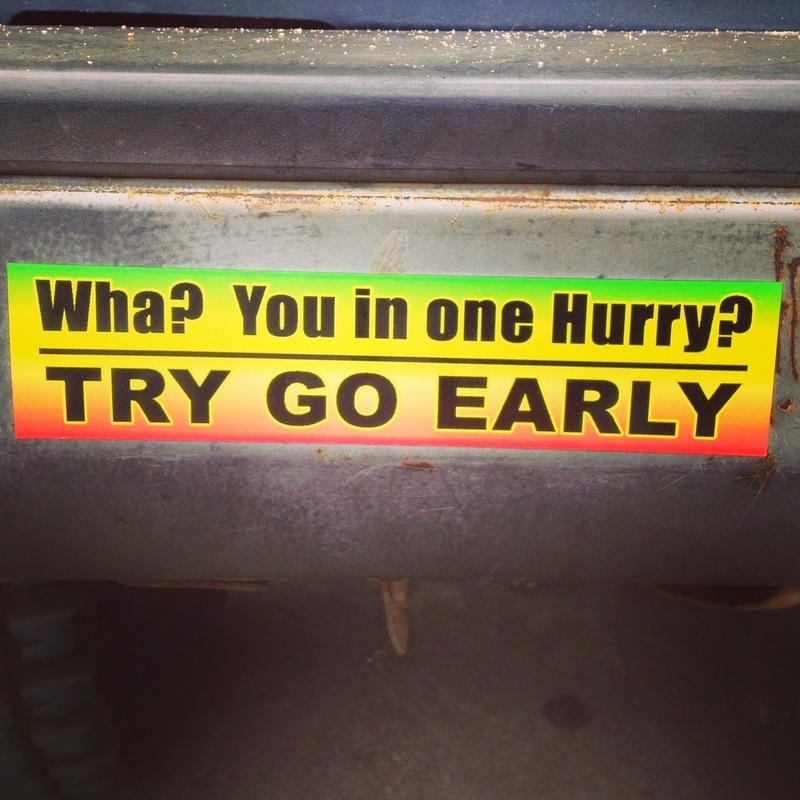 A Hawaiian pidgin bumper sticker. It makes sense to an English speaker, but the grammatical structure is that of pidgin. Now, linguists are saying that pidgin is a real language and have analyzed it to find consistent rules of grammar and usage. 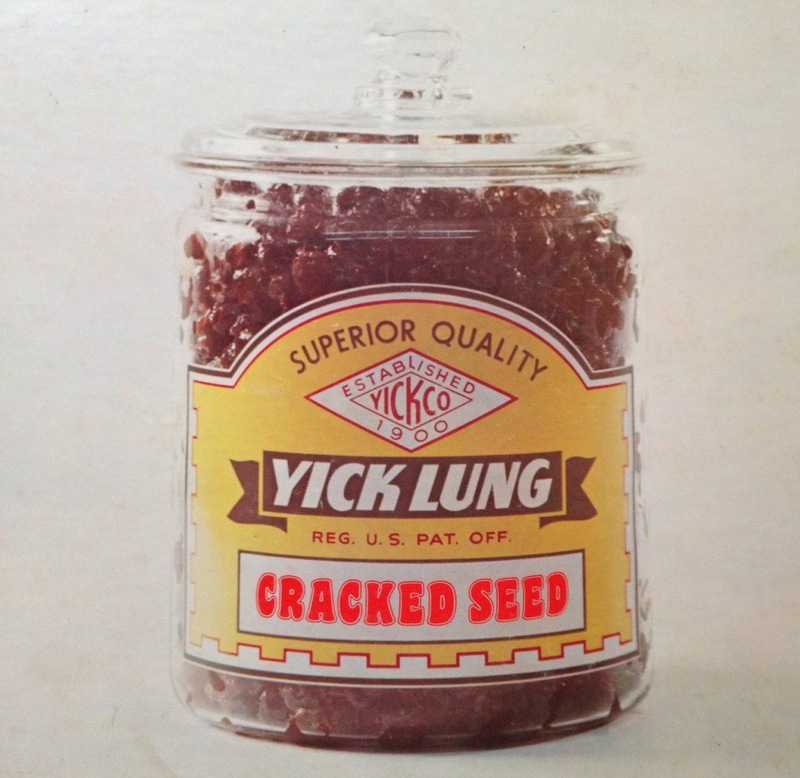 Some linguists believe there are more than 600,000 native pidgin speakers. For some people in Hawaii, it is the first language they learn. But it is not the language of business, of education, or of higher classes. This video "Sh*t People From Hawaii Say" may not make any sense, but you might hear people in Hawaii talk this way. During my childhood, pidgin was frowned upon. Teachers didn’t like pidgin in the classroom because they feared their students would never speak proper English or get real jobs. While I understand some pidgin, I was not allowed to speak it. You could say, pidgin was kapu (forbidden). My mother flipped out when I came home from school speaking pidgin. (In pidgin, you might say “her mass wen drop” like “her mouth (jaw) went dropped.”) So I never really learned it. I’ve always been a bit sad about that because I was a bit of an outsider growing up in Hawaii and knowing more pidgin would have made things easier. Thank Goodness for books like Pidgin to da Max which help fill in the gaps. 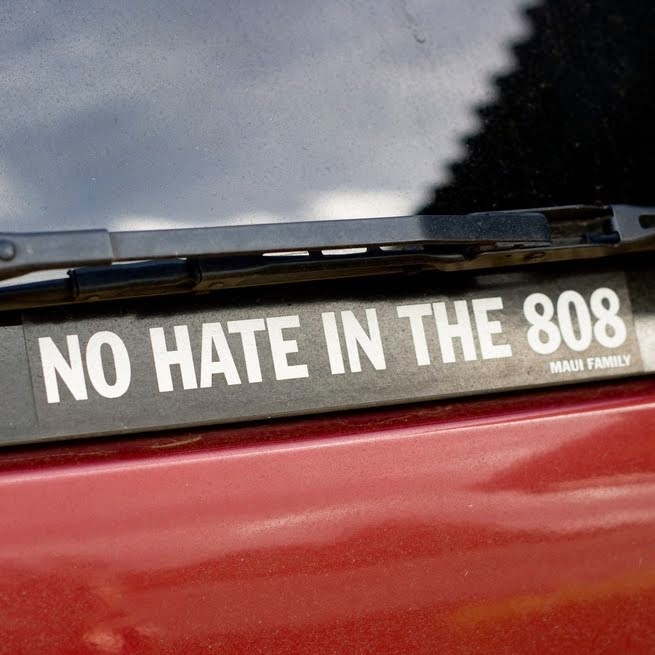 This is a wildly popular book in Hawaii, and a must-read for anyone who lives here. A classic book on Hawaiian pidgin (and it's pretty funny too). Important Note: Pidgin, to me, is a language of insiders. If you do not know pidgin and try to speak pidgin with most locals, they may laugh at you or worse yet, take offense. There are classes for pidgin and it may be ok to practice with other students or with good friends, but not everyone. 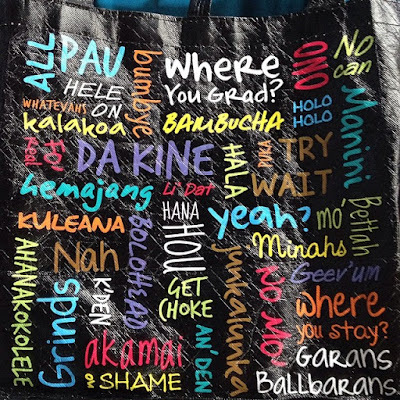 Foodland Supermarket's pidgin shopping bag. Another post on pidgin: Kathy "Tita" Collins shares Hawaiian ghost stories in pidgin, These videos are easier to understand than the one above. 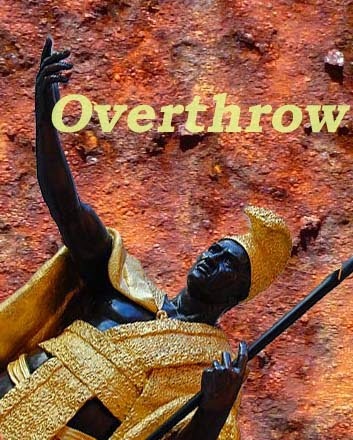 The word overthrow has at least two connotations in Hawaiian history. The first is the overthrow of the kapu system, but for more people the word overthrow refers to the coup d'etat of the Hawaiian kingdom. The 1893 overthrow of the Hawaiian monarchy was a carefully orchestrated and bloodless coup. It has some parallels to the Russian takeover of Crimea and to the colonization of Native American tribal land. Overthrow image represented by the symbol of the king falling. 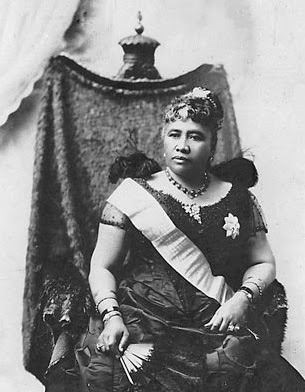 Queen Lili'uokalani wanted a new constitution. The constitution she inherited was so weak that it did not even allow Hawaiians, citizens of Hawaii, to vote. But it did allow Caucasian foreigners (haoles) to vote and hold office, even though they were not citizens! Meanwhile, American businessmen and politicians were meeting to discuss the possibility of annexing Hawaii. In January 1893, things came to a head. Rumors of the Queen’s new constitution triggered a series of events, leading to American troops in Hawaii, a new provisional government, and the overthrow of the monarchy. Eventually Hawaii would become annexed by the United States. One of the questions of the overthrow, that I've heard asked over and over, is Why didn't the Hawaiians fight back? I'm not a historian, but one answer is that the queen was told by her trusted advisors (some of whom were not Hawaiian) that she would be able to regain her kingdom back through diplomacy and to avoid bloodshed. Maybe she would have succeeded with more support. On December 20,1893, President Cleveland sent a letter to the Provisional Government of Hawaii, asking the provisional president to resign and to restore the Hawaiian Kingdom. This request was turned down. For years, the Queen continued to make diplomatic efforts to regain her kingdom. Though the events of the overthrow happened more than a century ago, it still can be felt in modern Hawaii. There is a sovereignty movement to restore the kingdom of Hawaii, going on for decades, just simmering under the surface. Most visitors are not aware of it, and it’s kept under wraps in most tourist areas, but it’s always present. Read a short bio of Queen Lili'uokalani from last year's A to Z Challenge. 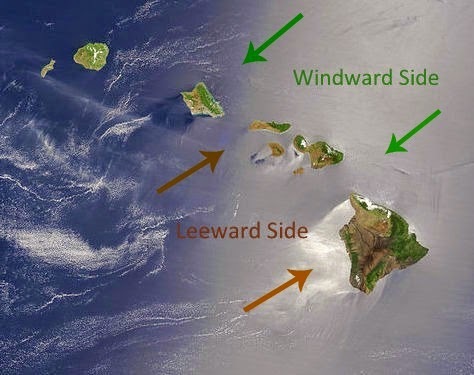 As a child growing up on the main island of Oahu, I always wondered about these mysterious Neighbor Islands. Maui, Molokai, Kauai, and the Big Island (to be confusing, this island has the same name as the state of Hawaii) were the fringes of the known world. The island of Kaho’olawe was still being bombed as a military test site. Ni’ihau was, and still is, forbidden to outsiders. Oahu in relation to the other islands, the Neighbor Islands. Who lived in these Neighbor Islands besides farmers and ranchers and plantation workers? Why did tourists go there? Didn't they used to be called the Outer Islands? When did they get the name Neighbor Islands? Was it connected with promoting tourism? 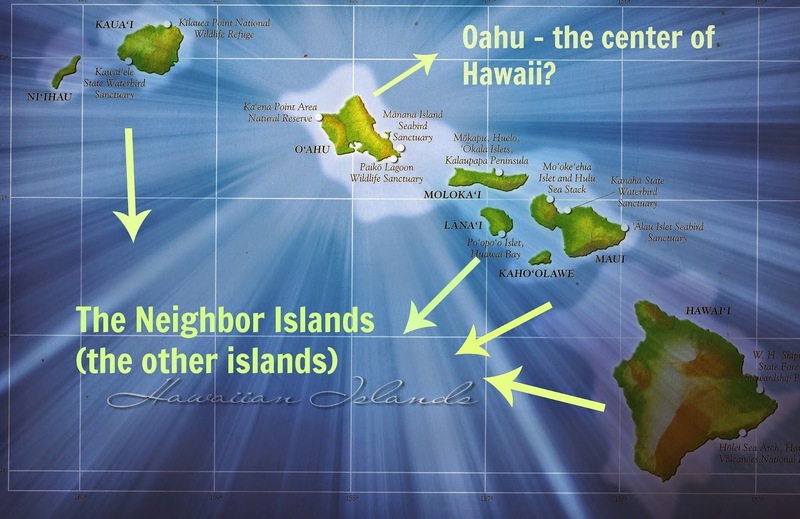 After all, Oahu was the center of everything. It’s where Honolulu, the state capitol is located. It’s the island of Pearl Harbor, Waikiki, Diamond Head, Hawaii Five-O and Magnum PI. It’s where King Kamehameha I ruled from after uniting (or conquering) the other islands. It’s where the overthrow of the Hawaiian monarchy took place. It’s where most people in Hawaii live, more than 1 million of us. Visitors to Oahu are often surprised by how built up and developed it is. The trick with Oahu is to know where to go, to find exquisite natural areas and beaches. As a child, the Neighbor Islands seemed so far away, even though it was only a 30 minute plane ride. When you add driving and airport time, they always seemed like they were in another state. Despite attempts at an interisland ferry throughout the years, it mostly hasn’t worked. The Neighbor Islands aren't secondary islands, but almost everything comes through Oahu. When I mail a letter to another town on Maui, it goes first to Honolulu on Oahu, then back to Maui. When we buy things at a store, they are often shipped from Oahu, which is where many distribution centers are. Now that I’ve lived on two Neighbor Islands, I can say plenty of people live outside of Oahu, and yes, there is a lot less nightlife here! There are real jobs, cars, hotels, houses, and problems. 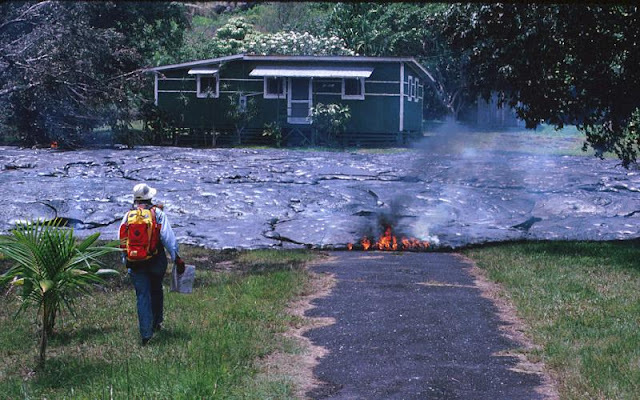 Some issues seem to affect the Neighbor Islands more than Oahu. These issues include the Superferry controversy, Jimmy Pflueger’s destruction of a coral reef and a dam on Kauai, and a hot issue now: GMOs (genetically modified organisms) because of the extensive GMO crop testing done here. Oahu residents sometimes seem so insulated to me, going from Longs (a drugstore), Foodland (a locally owned supermarket chain), Costco and Zippy’s (a local restaurant chain) while struggling with ongoing traffic problems. Neighbor Islanders sometimes look at horror at Oahu’s development, asking “Could that happen to us?” The answer is yes, if we don’t learn from Oahu. If this topic interests you, here’s another post about the differences between Maui and Oahu. 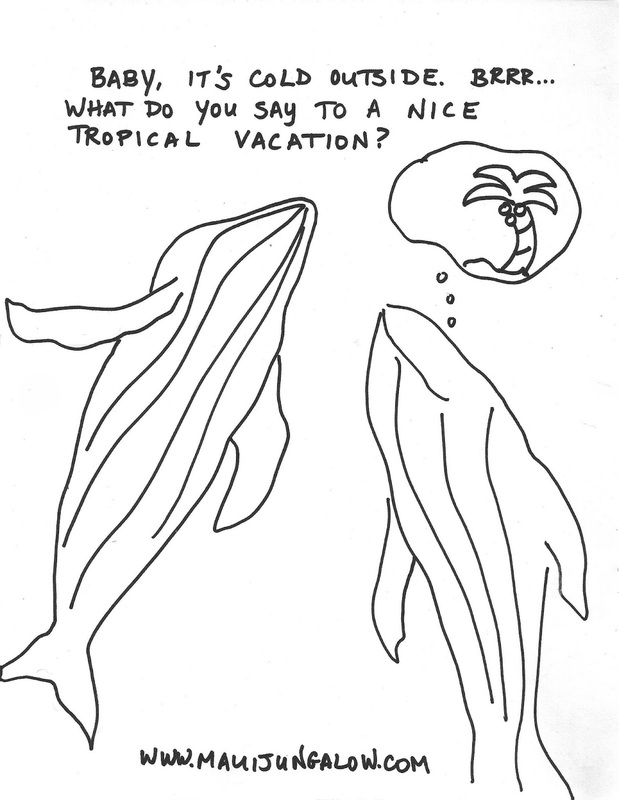 This animal often creates a lot of confusion for visitors to Hawaii. What is it? Is it a weasel, a ferret, a possum, a weird looking squirrel? It’s a mongoose, like the famous mongoose Rikki Tikki Tavi that Rudyard Kipling wrote about in India. The mongoose is one of those introduced species that someone thought would be a good way to control the rat population. Maybe the rats were getting into the sugar cane mill and eating everything. The mongoose can often be spotted outside beach trash cans around sunset. Two words: Epic Fail. Since rats are nocturnal and mongooses are diurnal, the two animals never met.